Curie Bed and Breakfast - Bloemfontein Accommodation. Currie Guesthouse is a highly recommended guesthouse in the Southern parts of Bloemfontein but still within five minutes of the city, stadiums and show grounds. We are also close to four shopping centrums as well as two private and two state hospitals in the case of an emergency. 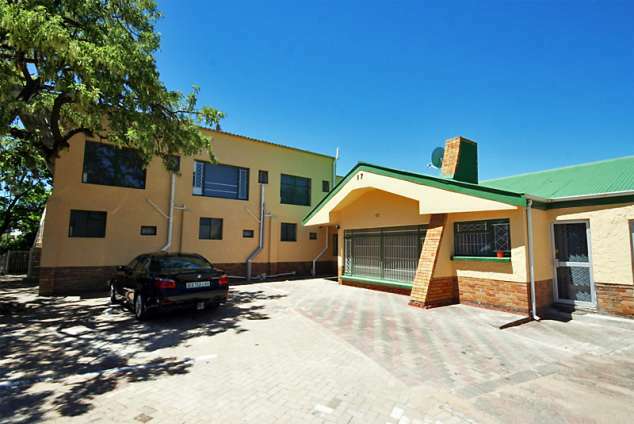 The guesthouse is located in Curie Avenue right next to the main road that comes from the N1 between Johannesburg and Cape Town. We have eleven spacious rooms that can be hired at a very affordable price, double rooms and single rooms. Every room is tastefully comfortable and furnished. Each room has a mini bar, TV with the guest house DSTV package and an on suite bathroom. Two of our rooms have a bath and shower, five rooms only shower and four only bath. Most of our rooms can accommodate up to four people. The Guest House has a lapa, swimming pool and braai area that the guests can make use of. We provide wood and braai packs with an additional fee if ordered in advance. Breakfast will be served in the mornings from seven till eleven, if ordered the previous day. We have two breakfast menus to choose from; Sunrise surprise - egg, bacon, toast, fried tomato, cereal, and coffee/tea. Morning supreme - eggs, bacon, toast, pork sausage, boere wors, fried tomato, cereal, and coffee/tea/juice. Please see Rates for prices. 13074 page views since 08 Mar, 2011.